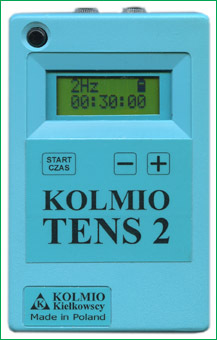 The KOLMIO TENS 2 electrostimulator is a device for Transcutaneous Electrical Nerve Stimulation (TENS). Thanks to small dimensions and simple usage it can be used by the patients themselves, with the advice from the doctor or an analgestic clinic. The KOLMIO TENS 2 device enables stimulation in two independent channels, at frequencies from 0,5 Hz to 200 Hz with an additional programs BURST (packages of high frequency impulses emitted in low frequency) and frequency sweeping (cycling frequency from lowest to highest and back). Procedure time can be set in the beginning; there is also the possibility to run the procedure without time limit. The KOLMIO TENS 2 electrostimulator is power by batteries, which makes it easier to use and eliminates the possibility of an electric shock. eliminating spine pains and much more.